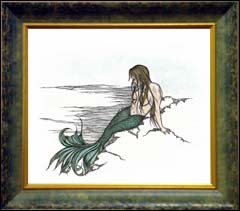 "Amphitrite - Queen of the Sea"
"Astraea - Goddess of Innocence"
"Lorelei - The Siren Awaits"
The images shown are the nine remaining original pen and ink drawings in my collection. They are available framed as shown. The Fish designs are drawn on Nautical charts of Key West and Costa Rica, while the Sea Maidens and Goddesses have a white background. You can commission custom designs of your own. Choose a coastal area and I'll order the chart. Provide photos of your favorite places, things and memories and I'll preserve them for you in Art! New Commissions Begin at $2,500.00 range to $10,000.00+, based on size, number of subjects and complexity. 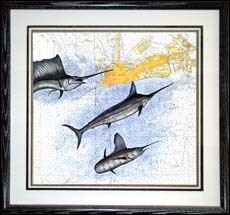 The Hammerheads, Kingfish and Tuna ("Out of the Blue"), The Offshore Slam ("Key West Offshore"), and the Billfish Slam ("Key West Billfish") were designed for a Key West and Lower Keys Annual Fishing Tournament A limited edition of framed prints were the trophies for the event. Queen of the Sea, the Mermaid "Amphitrite"(am-fa-tri-tee) is resting peacefully on the seashore. She's framed in acid washed Green and Gold Moulding with a white fabric mat and Gold fillet. 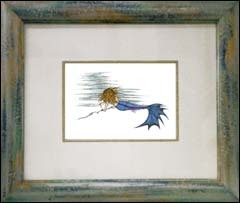 The mermaid "Astraea," Goddess of Innocence... as the wind blows through her hair, she casts her gaze far from shore. She's framed in an acid washed Blue, Lavender, White and Gold moulding with a white fabric mat and Ivory fillet. The Sea Maiden "Calypso" is beset with wings and fated to a life beneath the sea. 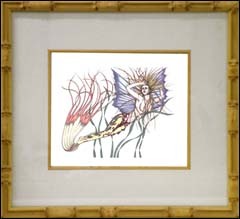 She's framed in Natural Golden color Bamboo with a white fabric mat and matching Bamboo fillet. Known as the Goddess of Dreams, the Mermaid "Lily" sleeps with her bouquet in hand atop a pebbly perch. She's framed in a Natural and Ivory toned distressed moulding with a white fabric mat and Gold fillet. Lying on the shoreline, the Siren "Lorelei" waits as her Sailors draw near. 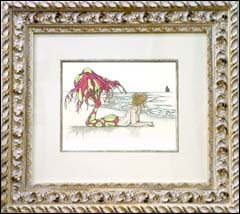 She's framed in an intricate Roman style moulding washed in White with Green and Natural highlights. Her mat is white fabric with a matching fillet. The Mermaid "Thalia" -- the Muse. Her wish is to Inspire. Gliding through the deep, she is the image of boundless Freedom. 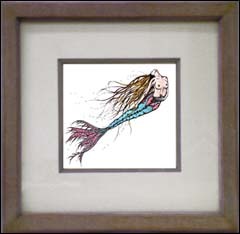 She is framed in a Natural Rustic Moulding with a light Mauve wash with a white fabric mat and matching fillet. 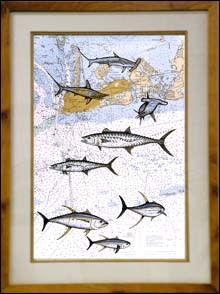 "Key West Offshore" features Offshore favorites--Sailfish, Dolphin (Mahi Mahi) and Wahoo--on a Nautical Chart of the Island of Key West in the Florida Keys. 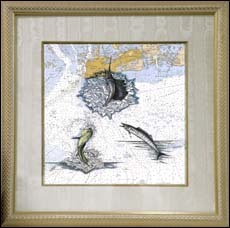 The art is framed in a white and gold moulding with "fish scale" detail. This piece also includes a white moire silk mat and beaded fillet. 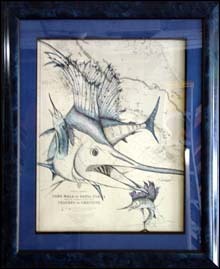 "Three Bills" showcases the Powerful Sailfish on a Nautical Chart of Costa Rica. The art is framed in fabulous cobalt and black moulding with a blue fabric mat and black fillet.